Okay, so I literally had a moment this morning when I looked at the clock like normal, I then looked in my bathroom mirror and thought, “It’s Saturday.” Then my eyes got really huge in shock and I started to scream in my head, “OMG IT’S SATURDAY, WHAT ABOUT MY SATURDAY SKETCH ARTICLE!?!? !” So anyways that was my morning, how was yours? So on to today’s Saturday Sketch. Here we have some art named, “Victini’s Gift” it was created by the deviantART user *Shaami. 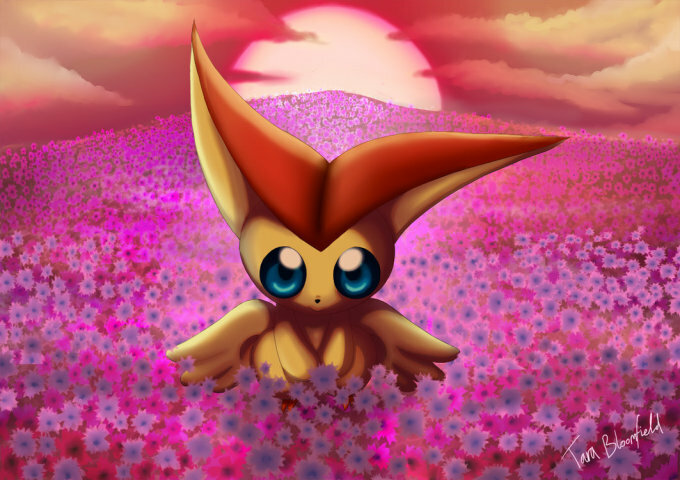 Victini in a field of flowers, thinking deeply about its past and what its future will hold as the glorious sun sets over the field. I feel as if it is a Victini month, because of the movies and Victini themed Pokémon events. Anyways, this is your Saturday Sketch for the week, See you all next week!